Labeling and Disclosure: Thank you to those KCFA members who sent requests to Senate Agriculture Committee Chair Clarence Nishihara requesting that he re-schedule a hearing on SB2354. This bill (introduced by Hawaii County Senator Russell Ruderman at KCFA’s request) would require express disclosure of the origin of the 90% foreign-grown coffee in packages of 10% blends—a modest but important step toward truth-in-labeling. The bill had been scheduled for a hearing before the Agriculture Committee on February 4, but was “deleted” from the hearing agenda with no explanation of a reason for the deletion. And thank you also for submitting testimony in opposition to SB1327, the 10% Hawaiian Chocolate Blend Bill. This measure would create the same sort of deceptive “10% blend” labeling law for chocolate as currently applies to coffee labeling–a step in the wrong direction. Hawaii State Association of Counties’ Origin Protection Bill: Hawaii County Council Member Karen Eoff has sent a letter to Rep. Jessica Wooley, Chair of the House Agriculture Committee, requesting that she schedule a hearing on HB213 and support its passage. This bill was part of the Hawaii State Association of Counties’ (HSAC) 2013 “Legislative Packet” and remains pending in the 2014 Session. It provides for origin protection and truth-in-labeling for all Hawaii-grown agricultural products, including coffee. To review the letter, click here: http://tinyurl.com/kc5cl6x. Thank you Karen Eoff for supporting farmers! 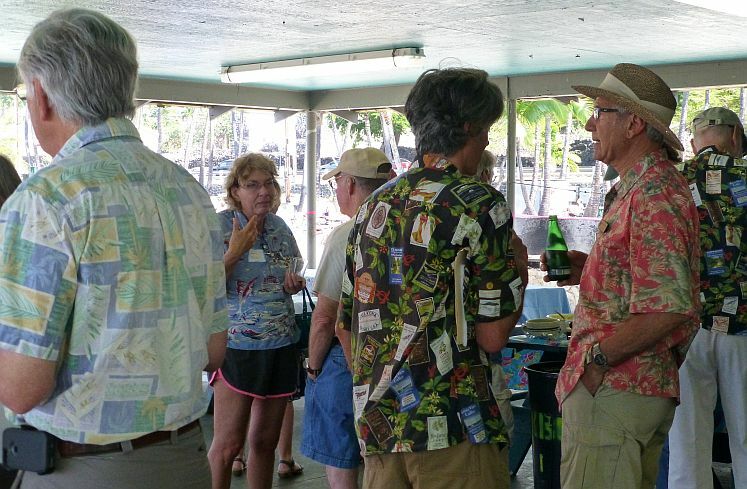 The Kona Coffee Farmers Association’s Annual Membership Meeting was held on January 12, 2014 in the Pavilion at beautiful Kahaluu beach. Elections were held and officers and the Board for 2014-2015 are: Cecelia Smith, President, Anita Kelleher, Vice-President, Thomas Butler, Secretary, and Kurt Schweickhard, Treasurer. Newly elected Directors Kally Goschke and Suzanne Shriner joined continuing Directors, Colehour Bondera, Christine Coleman, Bruce Corker and Mary Lou Moss. A bountiful potluck followed a summary of KCFA’s 2013-2014 efforts. It was agreed that the KCFA Priorities for 2014 are: #1 Promote Kona Coffee, #2 Education, #3 Legislative Action, and #4 Recruit and Retain members. 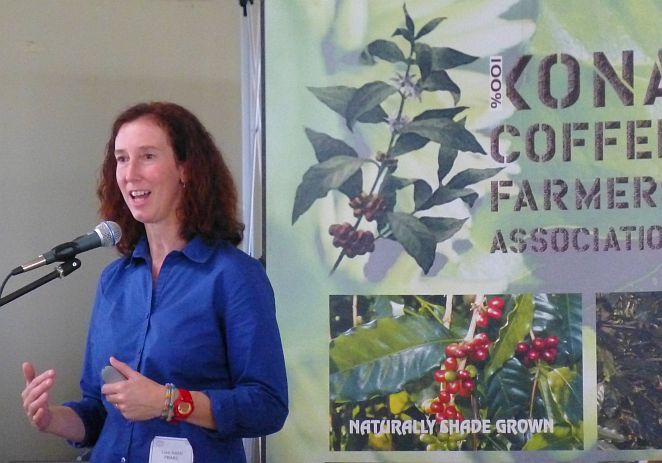 It was noted that KCFA is a “Member-driven organization” and all Members are encouraged to send their ideas, concerns or questions to info@KonaCoffeeFarmers.org or go here: http://tinyurl.com/kf8mxml to address the issue to a Committee. Please use the Subject: <KCFA Board> All input will be carefully considered and will help us to create another highly successful year for the Kona Coffee Farmers Association! Come brush up on your pruning techniques, ask questions and get wise answers! Ask questions and get wise answers! At the EXPO I was asked this question by a new farmer: Where can I get some coffee seedlings? While there are probably a few people selling potted seedlings, it is just as easy to locate seedlings (coffee seedlings are one of our bigger weed problems). Gently pull them or dig them up and transplant immediately to the new location. Make sure that this is accomplished when moisture is available or where you have the ability to water them. You will nearly get 100% success rate with this method. 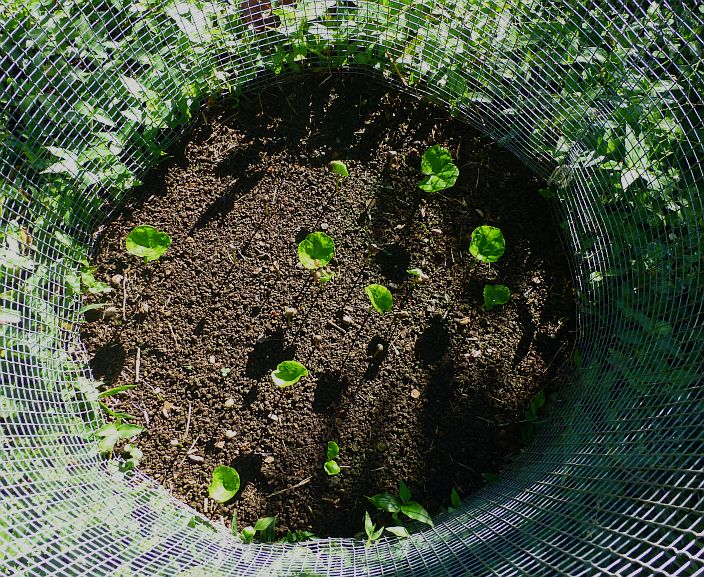 Another method is to plant seed directly where you want to establish a new plant. I often use this method; planting 6-7 parchment seeds spaced, as in the photo. After germination takes place (could take 5 weeks), I thin to 3 plants and grow all 3 for the full cycle (4 years) and when pruning happens, cull two. Believe it or not, using both methods results in the same size tree after 3 years. The advantage of planting seed is that you get a well rooted tree every time. The disadvantage of seed is that the very small seedlings require more care in the first year. A big mahalo to the 30 wonderful volunteers for working together as a team to put on the 7th annual EXPO! New volunteers helping this year were Pat & Roland Fornataro, Donna Meiners, Bud Jenkins, Tom Lawson and new board member Kally Goschke. A special thanks to Hans Eckert for volunteering 3 of his fabulous farm workers who helped the vendors set up; they were a great help and very much appreciated. Believe it or not, coffee makes an incredibly rich and beefy gravy for this pot roast. The roast is slow-cooked in the oven until fork tender. Serve with hot, buttered noodles or traditional mashed potatoes. On a large plate or platter, stir together flour, salt, and pepper. Dust the beef roast with the seasoned flour, discarding any excess. Heat the oil in a large, heavy ovenproof skillet over medium heat until hot. Add the roast and brown on all sides, about 5 minutes a side. Remove the roast from the skillet and set aside. Add onions to the drippings in the skillet and saute over medium heat until they are softened. Return the roast to the skillet; add bay leaves, thyme, water and coffee. Bring to a simmer, stirring and turning to combine the seasonings with the roast. Cover and place the skillet in the oven. Bake for 3 to 3-1/2 hours or until fork tender. Remove the roast from the skillet, discard any bones or gristle and set aside, loosely covered with aluminum foil. To prepare the gravy, place the skillet over medium heat, skim off any excess fat and add water, if necessary, to equal about 2-1/2 cups liquid. Sprinkle the instant flour over the gravy in the skillet and cook about 5 minutes, stirring until smooth and thickened. Stir in the butter and whiskey, if desired, and season with salt and pepper. Return the roast to the skillet to warm in the gravy, then serve.